It's a queen size, that her sisters had made for their mother (my grandmother, obviously). When she passed away 10 years ago, they all thought my mom should have it, it came to me now. Each block is specific to the grandchildren, as well as the sisters and some of the husbands. I would love to be able to share this with my family in a meaningful way. What I am about to say may raise a lot of angst, but I was thinking of deconstructing it, splitting it into the families and making wall hangings for each branch of the family. It was mostly hand stitched, all hand quilted about 40 years ago. It's been in a box, behind a book shelf for most of the last 10 years. Please give me a new idea. I don't want to deconstruct it, it seems wrong, but I don't know how to share it with my cousins without doing just that. I want to get this posted, but I will post a picture or two of it in just a few minutes. I agree that to deconstruct it would be wrong. Would it be possible to duplicate the blocks that were particularly relevant to each family member and present the blocks as a framed wall hanging or fabric art? Firstly I would ask the cousins what they want, after all not everyone feels the same way about things. If they do want a piece then I think it is a lovely idea to share so why not take a close up photo of the quilt and put a piece of the quilt and the photo into a frame that way it can be enjoyed and in view and hopefully last a very long time for future generations. They are precious and rare. Have you asked them how interested they are in having a part of this quilt? I know in my family there would be some who really wouldn't care at all about getting it, others who would want it all to stay in one piece and one who might truly treasure the section that was "theirs". I know, not much help, but I would probably want to keep it all in one piece unless somebody really, really, really wanted the part pertaining to their family. I like the idea of duplicating the relevant pieces, and yes, I am sure there are those in my family who could care less about a piece of it. Maybe a duplicate of the relevant pieces made into a wall hanging or framed or a pillow, and a really nicely done photograph of the whole thing. Great ideas! Don't harm the quilt! Rather than divide the quilt, why don't you join the creators and have a family gathering. The quilt can be the honored guest - just think of the new memories that can be created because of this wonder quilt. I like this idea, but we are scattered all over the country and that could be quite an undertaking. Food for thought though. Thank you for your suggestions. I have never done hand piecing or hand quilting, so I may try my hand at that, as tribute to my Aunties who made the quilt in the first place. I would hate to take apart something that had been lovingly hand made. Whoever made it put their heart into the work, because she loved everyone on it. Try to figure something else, like my-Ty. Have a party and let the quilt be the guest. I agree completely. Unfortunately, my daughters wouldn't care a thing about having it in a wall hanging. Now if they had the whole quilt, they would probably put it in one of their guest rooms and enjoy it there. The one that just had a baby might enjoy a replica of the blocks that pertained to her somehow sewn into a quilt for her daughter. It has such a nice wide sashing that I would cut it there. You could either bind each and use as a wall hainging, don't bind but frame each piece, or make into a pillow. This would leave all that hand sewing intact. It would be a shame to lose that. I just could not take it apart, would break my heart!! 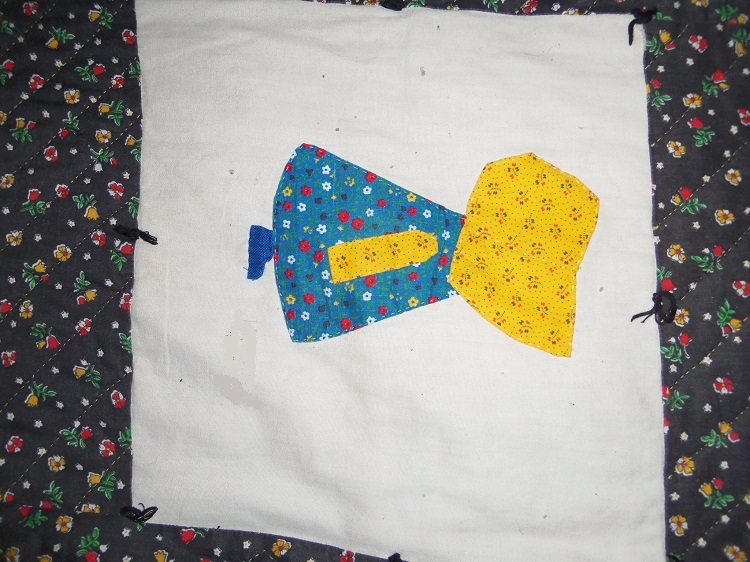 Many years ago, my MIL and her sisters (she had 7) each made a block for a Sunbonnet Sue quilt. One of the DILs (not me, this was before I began quilting) did a center block and put the quilt together. Then, each year, at the annual family reunion, the quilt got passed from sister to sister and it spent the year at that sister's house. For many years, it was passed from sister to sister, even as the sisters began passing away. Now, only one sister remains, and I have wondered where the quilt is. I like the idea of having the quilt and the blocks photocopied. You could make an album for each family. I am totally in the other court. The quilt is not a sacred thing. 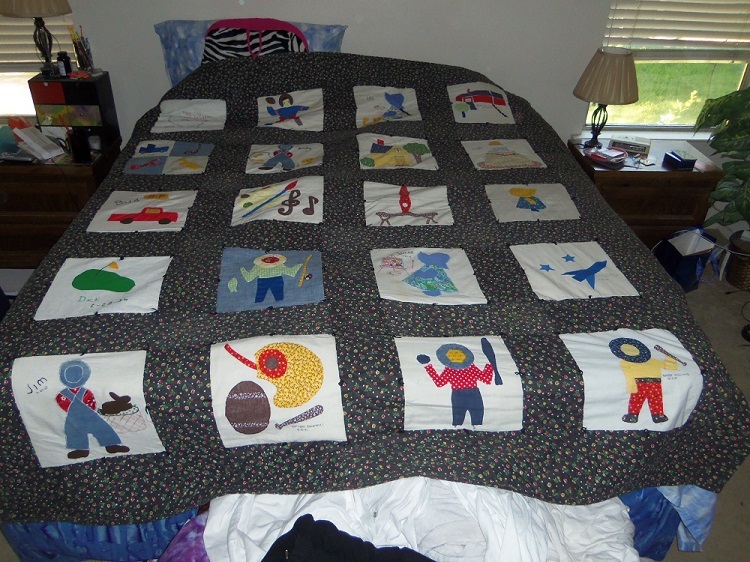 I think your idea of deconstructing it and sharing with others is the right one and it honors the spirit of the quilt. We have one of these quilts in my family also. How about taking a nice photo and transferring it to fabric with a picture of Grandma and making a wall hanging out of that? I don't know the dynamics of your family but could you have a "traveling quilt" that would spend time with the different family members who were interested in it? You would have to set up some rules and a label on the quilt should give the history of the quilt. Some great suggestions here - I would just go with what you feel comfortable doing. It is a wonderful heirloom! Maybe you could just take turns having it. let it change houses. When you grandmother passed, the sisters decided that your mother should have the quilt. Now it has been passed to you for safekeeping. Since too many people don't know how to care for a quilt and in today's modern world many don't have the space for display or storage or the memory of things ... take a picture of the quilt and a picture of your grandma, then write a "key" for the blocks, write the story of the quilt. Make everyone who expresses an interest a copy and keep the quilt together. Handwork is to be treasured. GrannyLady - Having too much fun dressing my grandaughters. I agree with a photo of the block that pertains to that family. Years ago my mom gave me a framed block from the Sunbonnet Sue quilt my Great Aunt had made me as a child. Years later she gave me the quilt but said she did not know what happened to the one missing block! Yea! I have it and can put it back in its place.